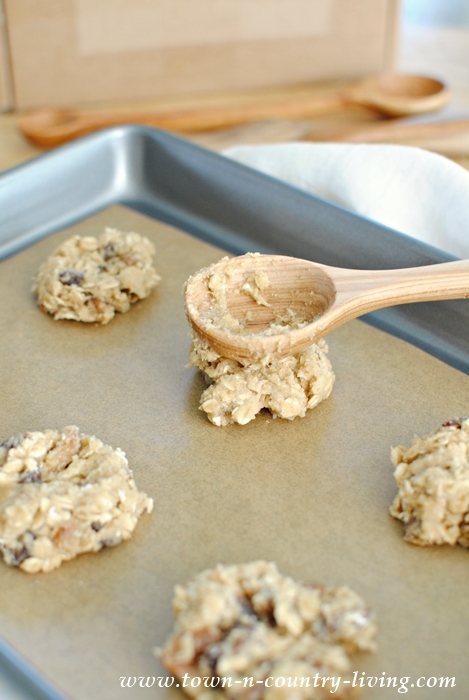 Oatmeal Raisin Pecan Cookies: Mmm, Good! When I have time, I enjoy cooking and baking from scratch. And when the fall season rolls around, the desire to bake is amplified! All those wonderful pumpkin, cinnamon, and maple flavors are just waiting to be turned into something special. 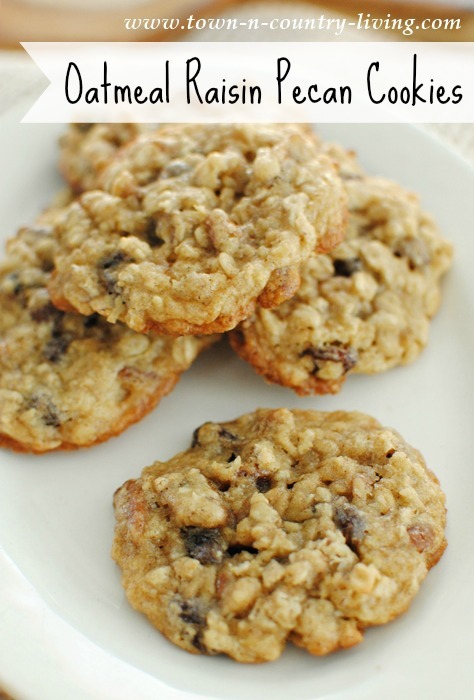 But today, I’m featuring tasty Oatmeal Raisin Pecan Cookies! These cookies have the perfect blend of a chewy inside and crispy outside, and they’re easy to make, which is always a plus. When baking and cooking, I love using my Dreamware pieces from Polder’s Old World Market. Each utensil is hand-carved. 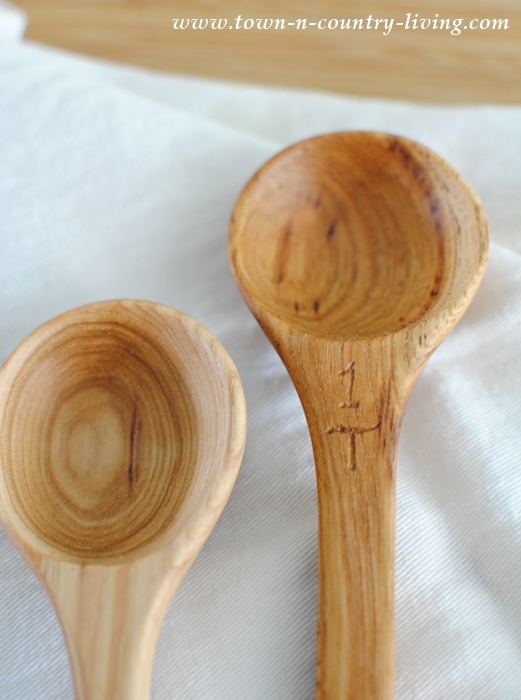 I even have a double-sided measuring spoon that has the measurement carved into the handles of each end. 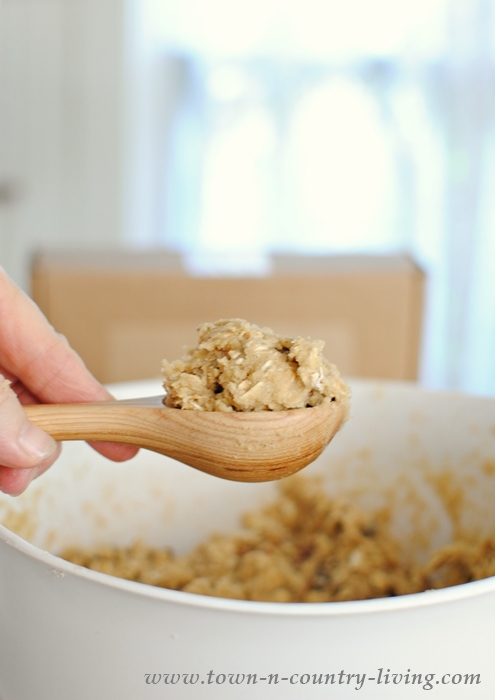 I also have a wooden cookie dough scoop that’s perfect for measuring out drop cookies. After placing the scoops of dough on a cookie sheet lined with parchment paper, flatten each dough ball just slightly with the back of the scoop. When the cookies have cooled a bit after coming out of the oven, move them to a cooling rack. 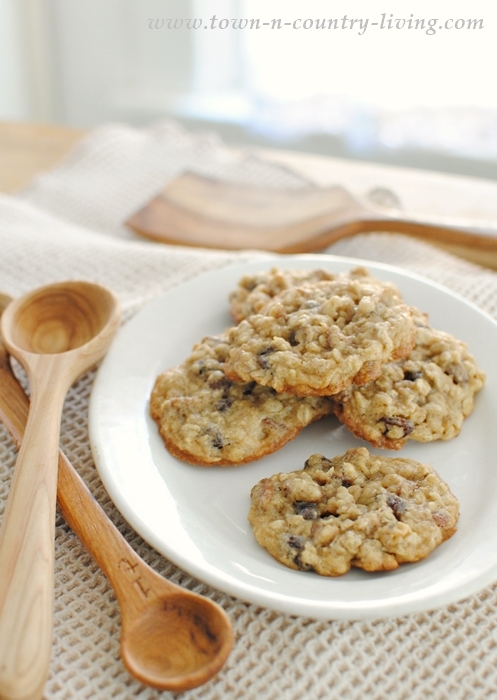 The fragrance of oatmeal raisin pecan cookies will fill your kitchen. Be prepared for the family to come running! 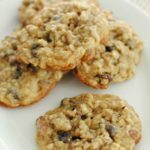 Hubby loves these Oatmeal Raisin Pecan Cookies, and so do I. The recipe below is a slight variation of a recipe from Ina Garten. Pre-heat oven to 350 degrees. In large bowl, beat the butter, brown sugar, and granulated sugar together on medium-high speed until light and fluffy. With the mixer on low, add the eggs, one at a time, and the vanilla. Sift the flour, baking powder, cinnamon, and salt together into a medium bowl. Slowly add the dry ingredients to the butter mixture at low to medium speed. Add the oats, raisins, and pecans and mix just until combined. 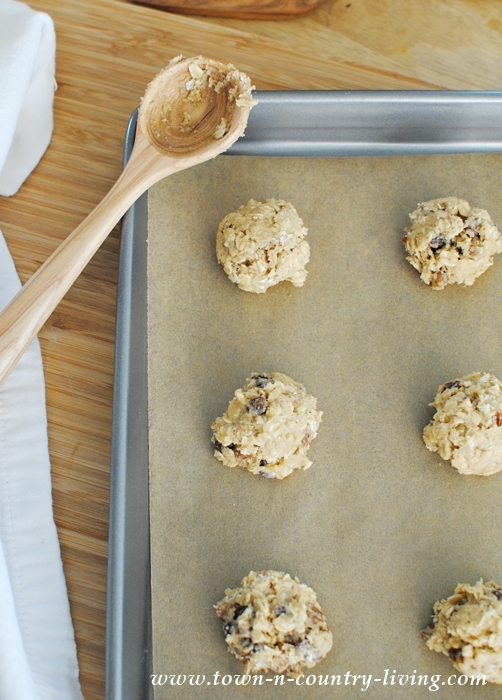 Using a cookie dough scoop or tablespoon, drop 2-inch mounds of dough onto sheet pans lined with parchment paper. Flatten slightly. Bake for 9 minutes until lightly browned. Transfer cookies to a rack and cool completely. I have been following old worlds newsletter for a while…I haven’t purchased any of their items yet but plan to. Your recipe looks like one my family would love! Have been receiving your newsletter as well of which I love by the way. Them wooden spoons look Awesome. I’ve been using my old stand by wooden spoon with broken handle for sometime now. Hubby just laughs when he seems me using the spoon with only half a handle. Hey, it still works so don’t have the heart to throw it away. This is my husband’s favorite cookie too! I’ll have to try your recipe. I usually leave those nasty raisins out of part of the cookies. I’m not a fan. ???? I’m following Old World Kitchen on Pinterest. I follow you on instagram and pinterest. I…have never been rendered speechless by wooden kitchen utensils but I was today. Such beautiful works of art. They are so beautiful that I actually saw myself using the spatula. Glorious. I even created an Instagram account so that I could follow Old World Kitchen! I am also following Old World on Pinterest and receiving their newsletter. I plan on making these cookies for the Memorial Day weekend and I’m going to add coconut (my husband is a retired solider and he loves coconut). Thank you for your blog and for posting such fantastic things. I signed up..looking forward to seeing new products! I receive Old World KItchen’s newsletter. I haven’t ordered anything yet but I think the cookie scoop looks like something I’d like. The towels look interesting, too. Your cookies look yummy. I’m going to try the recipe this weekend. Thanks. I just signed up to follow Pintrest and I already get their newsletter. Your cookie recipe sounds yummy. I am going to try them soon. I did go to Instagram to follow Old Worls Market and love the look of their wood spoons. I hope to win! I am now following Old World Market on Pinterest. Lots of good things there! I love to bake so thank you for the recipe. Following Old World Kitchen on Instagram. I’m signed up for the newsletter. Glad you have introduced me to these products. Following Old World Kitchen on Pinterest. I am subscribed to the Old World Kitchen’s e-newsletter. I subscribed to the Old World Newsletter. They looked gorgeous Now I am going to try your recipe. Hope to win. I am subscribed to the newsletter. I love wooden spoons. They are beautiful! The cookies look yummy, Jennifer. Thanks for sharing the recipe with us. Following on Instagram – Beautiful pics BTW! Following on Pinterest – looking forward to getting lost in those Boards! I have subscribed to the e-newsletter! Looking forward to getting it soon. Wow, these cookies look fantabulous! Plan on making them Monday! Thanks for sharing! Oh yeah, and I’ve subscribed to all 3…Instagram, Pinterest and E-Newsletter. Hope I win…those spoons are awesome! I follow the pinterest board. Following on Pinterest.. Spoons and spatula look great! Swoon! That cookie dough scoop is dreamy! I was already a follower on Instagram. Now following Old World Kitchens on Pinterest and I pinned your fabulous looking cookie recipe while I was there! I’m already a subscriber to their newsletter! Followed on Pinterest – swooning over these products! I love wooden utensils! These are gorgeous! I followed on Instagram – love their feed! I followed on Pinterest too! I am now following on all and subscribed. Your cookie recipe sounds divine. 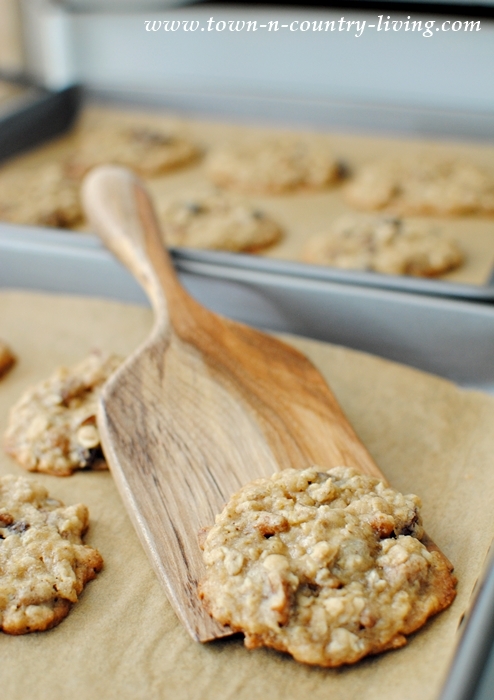 I recently made oatmeal, walnut, cranberry cookies and they were so fantastic. I very rarely eat sugar so always substitute stevia, but it doesn’t seem to make any difference in the taste, texture and overall yumminess of the cookies. I was already following on Pinterest (@polishedgirl). I was already subscribed via email. I’ve been following you for a while now! I follow Old World Kitchen on Instagram as @norma_watson. I follow Old World Kitchen on Pinterest as Cindy Aiton. I signed up for Old World Kitchen’s e-newsletter. I subscribe to the newsletter via e-mail. Am now following Old World Kitchen on Pinterest and looking forward to being inspired! Just signed up to receive the Old World Kitchen’s e-newsletter! I signed up your newsletter!